Hulu.com, the latest joint video venture between NBC Universal and News Corp. has been sending out thousands of additional invites lately to beta testers. I received mine last week and have been exploring the site ever since. The site was first announced back in March as a method of distributing broadband video services for NBC and FOX shows, such as Saturday Night Live, Family Guy, 24 and The Office to name a few. Since then they have been accepting requests for beta testers. While the service is being established, programming will also be available through distribution partner sites: AOL, Comcast, MSN, MySpace and Yahoo. Presently the content is only available for viewing in the United States, but due to some tricky internet tactics, I was able to view it while in Canada. According to Hulu’s blog, they’re working to release the rights of shows to be seen worldwide. As with any site, there’s always additional work to be done, and improvements will be made over time. Especially in the market of a free, online video streaming service such as Hulu, I’m sure other major television networks will want to tap into the online demographic and offer their content to another level of audience as well. As you may have known, NBC used to have a popular channel on YouTube, in which both companies partnered up to create in June 2006. Up until last month, the channel was still maintained. As the Hulu project has since progressed, the YouTube channel for NBC content no longer exists. 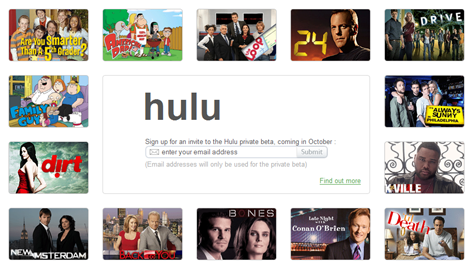 Hulu is rumoured to launch early next year to the public. FYI, the name Hulu was chosen because it is short and easy to spell, according to Jason Kilar, the chief executive of the initiative and formerly of Amazon.com. TechCrunch diagnosed what ‘Hulu’ means in another language.